QFitsView has three modes of operation, depending of what kind of data is being displayed. In case of one-dimensional data, the data are shown in an x-y plot. Two-dimensional images are shown in the main window. Three-dimensional data cubes can be displayed in a variety of ways, the third dimension is shown again as a x-y plot at the bottom of the image display. For instructions how to obtain and install QFitsView, go to the installing page. 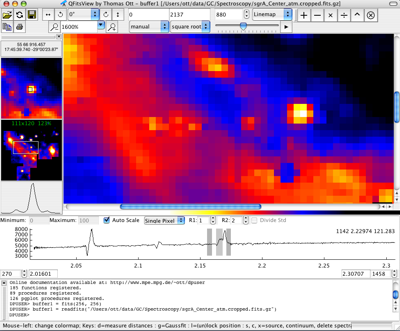 QFitsView was written by Thomas Ott as a software package for reducing astronomical data. If you have comments or suggestions regarding QFitsView, please feel free to contact me.